One of the things that I love most about reading is the ability to journey without leaving my cozy house or reading chair. After a long and somewhat difficult day, nothing was more appealing tonight than settling into that chair, with a warm fuzzy throw over my lap, and journeying by way of a wonderful historical fiction book to another place and another time. The Outlander Series, written by American author Diana Gabaldon, is comprised of 8 books that encompass several genres including historical romance, historical fiction, adventure and fantasy. I began reading the series and was drawn in immediately. The main character, Claire, is an World War II nurse who inadvertently travels back to 18th century Scotland, where she encounters Jamie McKenzie Fraser. A young strapping Highlander, Jamie is an intelligent, good humored man with a complicated past that keeps interjecting itself into his present life. Jamie rescues Claire after she finds herself transported to a different era, bewildered, and being pursued by an English army. It’s a colorful, rich, bawdy romp through a country that I dearly love. I finished reading book one, titled Outlander, while I was in Scotland last August. How incredibly amazing to read the book and then tour the Highlands. The places that were described in the book, I saw. It was not difficult at all to peer into thick green forests and imagine Jamie and Claire riding their horses through the trees. Although the story takes place in the 18th century, Scotland is not that much changed! Standing there in the mist, on the shores of Loch Lomond, I could feel the ancientness of that country, feel the history seep into my feet from the ground. It was magical and unforgettable. 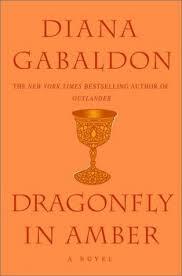 I am now reading in the second book, Dragonfly in Amber, and I’m grateful that there are six more books! Due to the popularity of the series, Starz now has a TV series that captures the adventures of Claire and Jamie in a more visual way. I don’t get the Starz channel, so I look forward to season 1 coming out later this year. Then I can journey back to Scotland in a more profound way, as the series was filmed on location in Scotland. For this evening, I’m content with my book….and my oh so vivid imagination. That’s all I need really, to be back in Bonnie Scotland again.